Tell us a little about the history of your city’s drinking culture. What are the traditional drinks and how are things changing? Sydney has a pretty amazing drinking culture, regardless of what you see in the media about the lockout laws (introduced in 2014 with the aim of reducing alcohol-fuelled violence etc). Although this hurt the night clubs and late-night destinations, the small bars licence was introduced in 2013, which in turn has seen countless amazing small bars being opened. 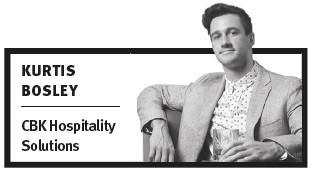 Sydney is also attracting world-renowned bartenders and operators, pushing the level of drinks and innovation further forward – Employees Only recently opened, and Martin Hudak & Andrea Gualdi (formerly of The Savoy and Artesian) are working behind Maybe Sammy which is soon to be opened. Consumers are putting more faith in bartenders to guide them in their drinking habits. How advanced is cocktail culture in Sydney? I’m fortunate to travel quite regularly and, without a doubt, can say we are one of a few drinking destinations that are truly elevating drink culture. You don’t have to go much further than Orlando Marzo’s win at World Class this year to show this. For me highlights are Maybe Frank (Andrea Gualdi & Stefano Cantino heading up the space), Old Mate’s Place (the whole team there is incredible), Jenna Hemsworth at Hubert, James Irvine at Four Pillars, and the crews at Ramblin Rascal and This Must Be the Place. Where do you think the city ranks in terms of bar scenes in Australia – is it leading the way or are other cities and scenes more influential? Melbourne and Sydney are traditionally the two hot spots but Ollie Margan, co-owner of Maybe Mae and Bread & Bone, and the crew in Adelaide have been pushing forward for the past few years so although we’re up there, there are definitely other cities to consider when looking to drink in Australia. Do economical shifts affect cocktail consumption? I don’t think it does – at least here in Sydney. Regardless of how the economy is tracking, people will still find a way to enjoy food and drinks out. What are the challenges the city’s bartenders/bar owners face? Are there political, religious and cultural barriers? The laws around licensing and alcohol consumption are so tight – that’s definitely the biggest challenge. Culturally we all like to drink so we really have it quite easy in Sydney. Who made you the best cocktail you’ve had in Sydney? Michael Chiem’s PS40 Breakfast Negroni is seriously the best liquid I’ve ever tasted.